Welcome to Our SMART* School! It is our intent to highlight different news items on this home page we believe you may be interested in reading. If you have an item you'd like to include, please see the office. Heather got her Black Belt! She was awarded on Tuesday, June 19th by Master Bill and Grand Master K with friends and family in attendance. Congratulations, Heather!!! 3 Months for Price of 2! 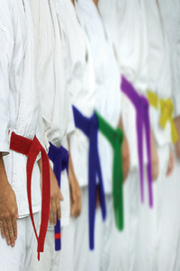 For a limited time, Master K's Karate of Shelby Township is offering a 3 for 2 to all new students. That's right, three months of training for the cost of only two! Call or visit for details. Expiring Soon! To all the students that offer their time and skill to help instruct others: Thank you! It is a great reflection of your strength of character and understanding of the pay-it-forward concept. This page will be as current as time allows.